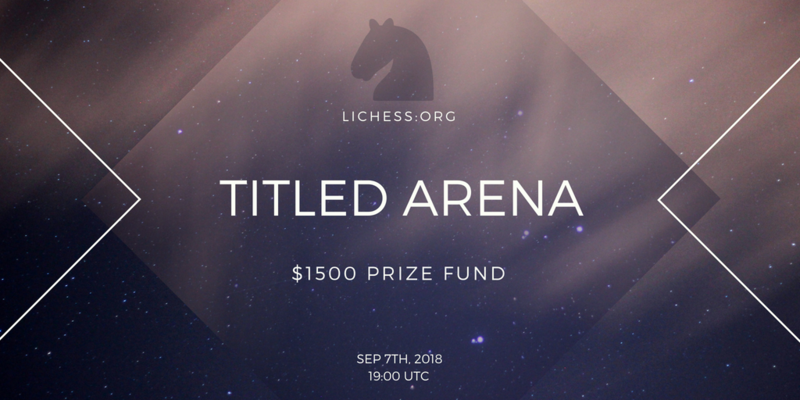 The 7th Lichess Titled Arena! It's been a month since GM damnsaltythatsport (Magnus Carlsen) reclaimed the most important throne by winning the sixth Titled Arena, and now it's time for the next one! Since Magnus donated his prize back, the winner takes home $1000 this time! At fashionably late notice, the next Titled Arena will take place Friday, September 7th. We've had a bunch of players streaming the previous Titled Arenas, including Magnus Carlsen, John Bartholomew and ChessNetwork. We encourage both participants and fans to livestream the tournament. If you plan to, check out our small streamer's kit for some useful graphics to include in your overlay.